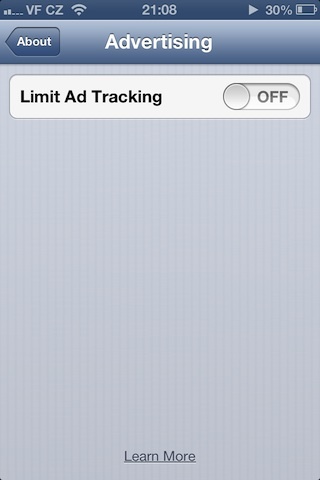 The new feature, oddly hidden under the About settings rather than Privacy, presents a single option to enable "Limit Ad Tracking," a setting that is left off by default. In contrast, Apple has a Safari Privacy preference that by default blocks cookies "from third parties and advertisers," a setting that Google bypassed to collect data across the pages a user visited in order to serve more relevant ads, earning it a $22.5 million slap on the wrist it paid without admitting any wrongdoing. On iOS, Apple's more conservative approach to blocking ad tracking may relate to the fact that a large number of apps rely upon ad networks for monetization, and that Apple itself has a horse in the race with its own iAd program. At the same time, Apple was not happy to see third party developers and ad networks using iOS users' UUID (universally unique device identifiers) to perform sophisticated tracking of individual devices (web cookies, unlike UUIDs, can't track a specific computer, and can be deleted by the user), particularly when they tracked UUIDs down inside Apple's headquarters to spy out new models. That led to the company deprecating the ability of third party developers to obtain the UUID of the devices they ran on in iOS 5. In iOS 6, Apple is now substituting what it refers to as an "Advertising Identifier," which users can now selectively disable. In a linked "about" page (depicted above), Apple explains, "iOS 6 introduces the Advertising Identifier, a non-permanent, non-personal device identifier, that advertising networks will use to give you more control over advertisers' ability to use tracking methods." It adds, "if you choose to limit ad tracking, advertising networks using the Advertising Identifier will no longer gather information to serve you targeted ads. "in the future all advertising networks will be required to use the Advertising Identifier. However until advertising networks transition to using the Advertising Identifier you may still receive targeted ads from other networks." 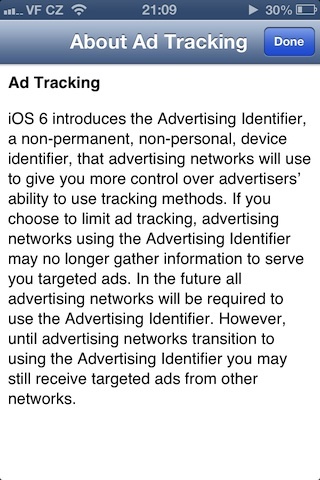 Apple has already set up an opt-out path for users who didn't want to be tracked through the company's own iAd program, but the new Advertising Identifier makes it easier for iOS users to block any ad network from maintaining a record of their preferences and behaviors, something that advertising networks use to target ad placement and therefore provide more valuable (and therefore more expensive) messaging placement to their advertising clients.